Enter the world of cream blush. I’ve already been raving about how natural and healthy cream blush makes you look when I reviewed the Maybelline Dream Bouncy blushers. Given that they were only available in the US, I was asked for my thoughts on a UK cream blush. So, let’s not beat about the b(l)ush – here it is! 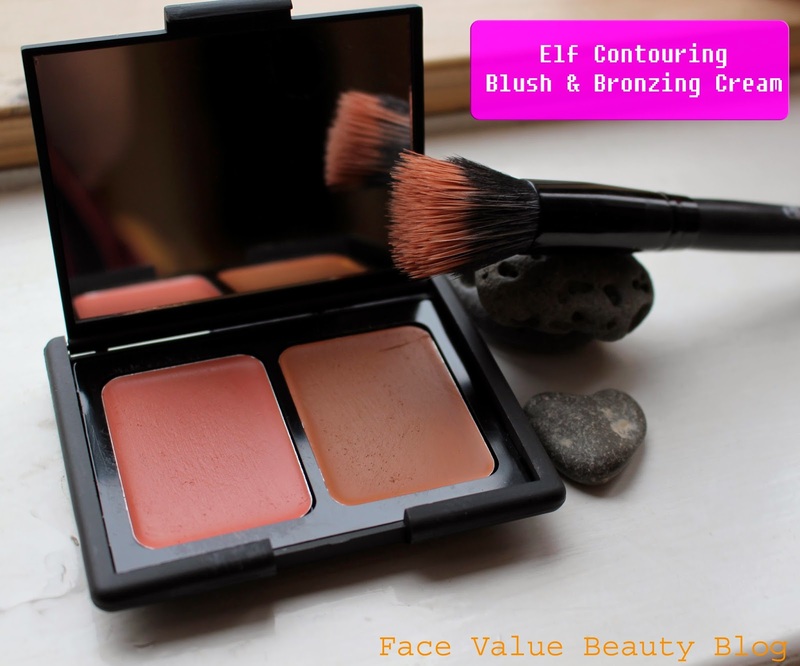 The elf Cosmetics Cream Blush and Bronzer. I know Im totally cheating because really, it’s two products into one case, but hey – IT’S TWO PRODUCTS in ONE CASE – what could be bad about that?! Yes, yes, I know I’ve committed the cardinal blogging sin and taken pictures after it’s been used but hey – I’m only human. I rush to use new products straight away, and deal with consequences later. Take THAT blogging etiquette! This compact is called St Lucia and these are GREAT colours. Good with a tan, or without. it’s not shimmery so it’s great for shading and contouring. And as it’s a cream, it’s a lot less “finished” than powder, so your clever contouring invisibly blends into your skin – err yah, these killer cheekbones are definitely real. relatively pared back – it’s not too in your face and it’s not too pink! 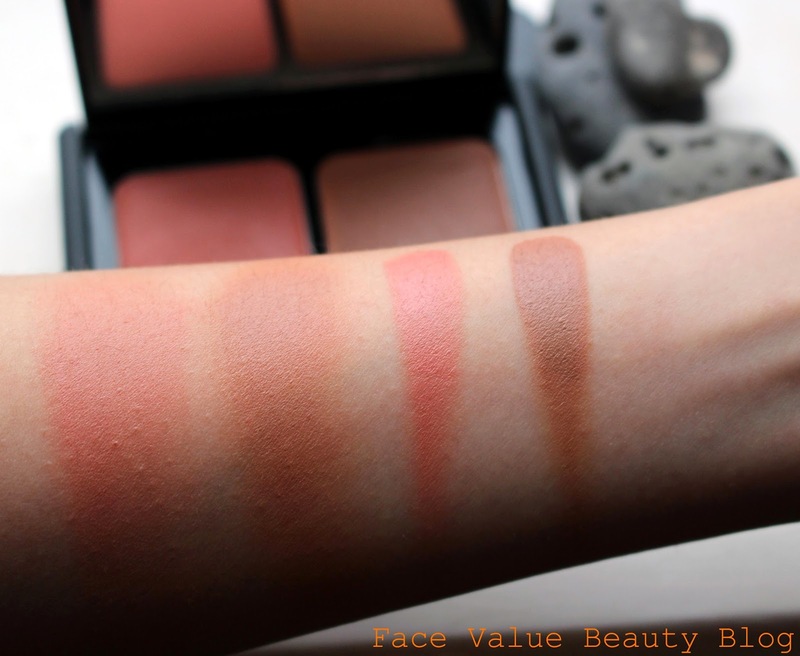 pale skintones who want something in between blush and bronzer. you can have it sheer and natural, or you can layer it up like a pageant queen. The above photo shows the creams straight out of the pan and slightly blended but you can get it much much more subtle than this!!! Imagine going out with those stripes on your cheeks!! 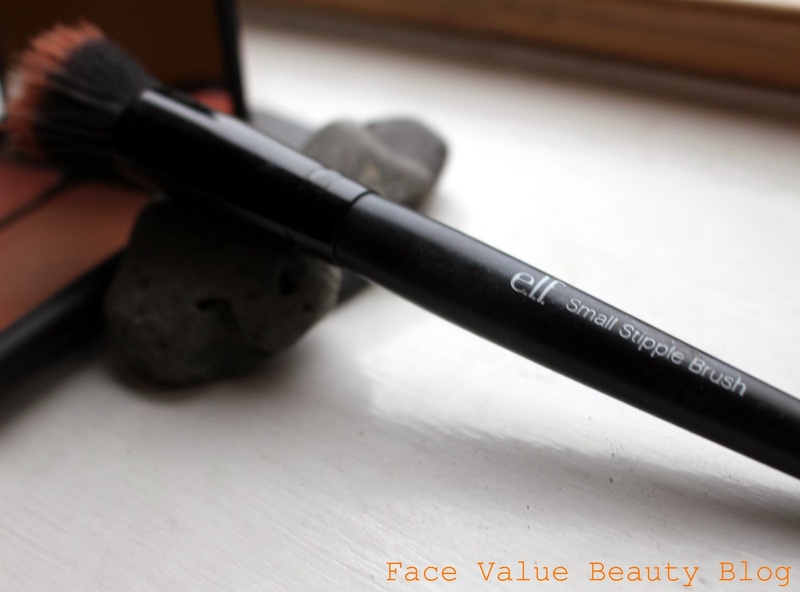 Face Value Tip: Dot this along your cheekbones with a stipple brush and blend, blend blend! Thoughts on elf Cream Blush & Bronzer? make sure that my brush has blended out all the edges. it melts into the skin and it tends to last quite long. It also gives a hint of dewy shine which looks a lot more natural than powder blush. Finally – I really recommend a stipple brush for cream textures like this. I was originally using the full size stipple brush but actually this elf small stipple brush gives great control and accuracy – it’s much much easier! I HAVE TWO. This elf cream blush and bronzer usually retails at £3.75 – yup, you heard right. Oh – and if this wasn’t cheap enough there’s a deal going on right now! This deal is the best, I do it everytime!! 50% off elf cosmetics AND free delivery. Spend £30 in your basket, then add code 50022014. Valid on ALL items, including sale, until 10.30pm on Sun 17 Feb.
For a list of my favourite elf products, check out my Elf Favourites post from the last time they did this deal. I really recommend : Small Stipple, Lip Balm Tint, Jumbo Lip Crayon, Blush/Bronzer compacts, Tone Correcting Powder, HD Powder …. the list goes on and on! Have you tried Elf Cosmetics? What are your favourite products? What do you think of cream blush? Are mojitos and Mcdonalds THE best combination ever?? I bought this last week but in powder form. Wish I had bought the cream vision instead, looks far more blendable then the powder.